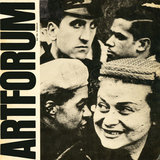 THE PHOTOGRAPHER WILLIAM KLEIN had initially been a painter embroiled in experimental Parisian abstraction of the ’50s. Later, in the ’60s, among his many careers, he became known as one of the most successful photographers of international high fashion. At the peripheries, then, of the work for which he’s justly famous—gutsy reports of the megapolis 25 years ago—there are analogies to the efforts of two other Kleins, Yves and Calvin.